SCADA Server Software that runs the SCADA/HMI application. Contains the tag database, historian, alarm list, and event log. Runs Drivers to communicate with PLCs, IoT devices, and other data sources. Provides data to client software. Supports multiple Operator Interfaces and Configuration Tools. Enforces security and User Rights. The SCADA Server is supported on Windows and Linux operating systems. Configure tags to represent PLCs and communication channels. Configure IO Data Point Tags to represent equipment or process. For example valve state (open or closed), pressure, temperature, and so on. Use the Graphic Editor to configure graphic pages to visually represent plant and equipment. Use the Toolbar Editor to configure the toolbar in the Operator Interface. Configure trend tags to show how process variable change over time. Configure alarm tags to indicate abnormal conditions. Configure calculated tags and programs. Configure how events are recorded in the event log. Configure Database Tables to store batch results and application specific data. Run queries on the tag database. Monitor tag status in real time. Monitor communication channels in real time. Graphic pages showing plant and equipment states. Trend pages showing how process plant variables change over time. The alarm list showing abnormal plant and equipment states. The event log showing the history of significant events. The Operator Interface is supported on Windows, Linux and Android operating systems. An ODBC Driver to allow office applications access to SCADA Data. 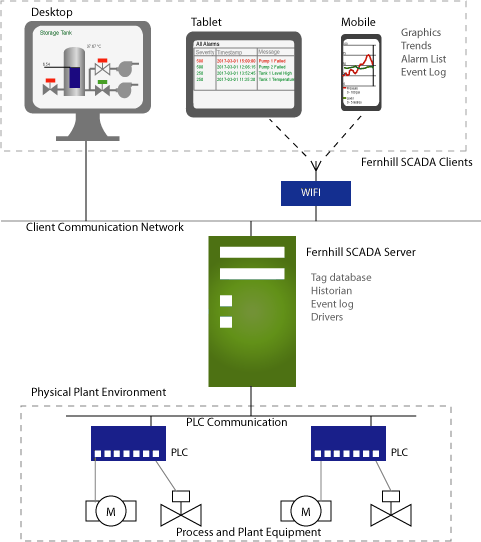 An OPC Server to allow Fernhill SCADA data to be integrated into 3rd party SCADA applications. A Java API to allow Java applications access to Fernhill SCADA data. A .NET API to allow Common Runtime Language (CLR) applications access to Fernhill SCADA data. To learn about installing Fernhill SCADA. To learn about changes in this version of Fernhill SCADA. To learn about the features and concepts behind Fernhill SCADA. For more information on the tools to monitor and control Fernhill SCADA. To learn about the features of the Fernhill SCADA Server. To learn about providing PLC data to other applications. To learn about drivers that access different data sources. For the license terms of Fernhill SCADA.